I’m not Italian; never claimed to be. 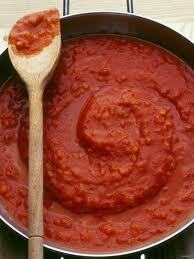 So this isn’t Papa Antonio’s secret sauce; you can find yummy marinara recipes elsewhere. This is so you can make a clean, preservative-free, easy sauce you can use on whole wheat pasta or atop a spinach salad (which I now commonly use instead of pasta); double the recipe and freeze it to save time later if you like.